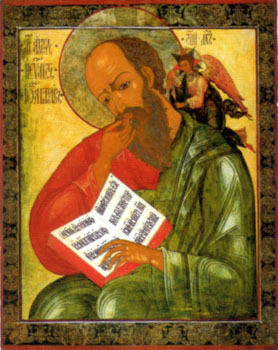 The Holy Apostle and Evangelist John the Theologian was the son of Zebedee and Salomia – a daughter of Saint Joseph the Betrothed. Together at the same time with his elder brother James, he was called by our Lord Jesus Christ to be numbered amongst His Apostles, which took place at Lake Gennesareth (i.e. the Sea of Galilee). Leaving behind their father, both brothers followed the Lord. The Apostle John was especially beloved by the Saviour for his sacrificial love and his virginal purity. After his calling, the Apostle John did not part from the Lord, and he was one of the three apostles who were particularly close to Him. Saint John the Theologian was present when the Lord resuscitated to life the daughter of Jairus, and he was a witness to the Transfiguration of the Lord on Mount Tabor. During the time of the Last Supper, he reclined next to the Lord, and at a gesture from the Apostle Peter, he pressed nigh to the bosom of the Saviour and asked the name of the betrayer. The Apostle John followed after the Lord, when they led Him bound from the Garden of Gethsemane to the court of the iniquitous high-priests Annas and Caiphas. He was there in the courtyard of the high-priest during the interrogations of his Divine Teacher and he resolutely followed after him on the way of the Cross, grieving with all his heart. At the foot of the Cross he went together with the Mother of God and heard addressed to Her from atop the Cross the words of the Crucified Lord: “Woman, behold Thy son” and to him “Behold thy Mother” (Jn.19:26-27). And from that moment the Apostle John, like a loving son, concerned himself over the Most Holy Virgin Mary, and he served Her until Her Dormition, never leaving Jerusalem. After the Dormition of the Mother of God the Apostle John, in accord with the lot that had befallen him, set off to Ephesus and other cities of Asia Minor to preach the Gospel, taking with him his own disciple Prochorus. They set off upon their on a ship, which floundered during the time of a terrible tempest. All the travellers were cast up upon dry ground, and only the Apostle John remained in the depths of the sea. Prochorus wept bitterly, bereft of his spiritual father and guide, and he went on towards Ephesus alone. On the fourteenth day of his journey he stood at the shore of the sea and beheld that the waves had cast ashore a man. Going up to him, he recognised the Apostle John, whom the Lord had preserved alive for fourteen days in the deeps of the sea. Teacher and student set off to Ephesus, where the Apostle John preached incessantly to the pagans about Christ. His preaching was accompanied by numerous and great miracles, such that the number of believers increased with each day. During this time there had begun a persecution against Christians under the emperor Nero (56-68). They took away the Apostle John for trial at Rome. The Apostle John was sentenced to death for his confession of faith in the Lord Jesus Christ, but the Lord preserved His chosen one. The apostle drank out of a cup prepared for him with deadly poison but he remained alive, and later he emerged unharmed from a cauldron of boiling oil, into which he had been thrown on orders from the torturer. After this, they sent the Apostle John off to imprisonment to the island of Patmos, where he spent many years. Proceeding along on his way to the place of exile, the Apostle John worked many miracles. On the island of Patmos, his preaching accompanied by miracles attracted to him all the inhabitants of the island, and he enlightened them with the light of the Gospel. He cast out many a devil from the pagan-idol temples, and he healed a great multitude of the sick. Sorcerer-magicians with diverse demonic powers showed great hostility to the preaching of the holy apostle. He gave especial fright to the chief sorcerer of them all, named Kinops, who boasted that they would destroy the apostle. But the great John – the Son of Thunder, as the Lord Himself had named him – by the grace of God acting through him destroyed all the demonic artifices to which Kinops resorted, and the haughty sorcerer perished exhausted in the depths of the sea. The Apostle John withdrew with his disciple Prochorus to a desolate height, where he imposed upon himself a three-day fast. During the time of the Apostle John’s prayer the earth quaked and thunder boomed. Prochorus in fright fell to the ground. The Apostle John lifted him up and bid him to write down, that which he was to speak. “I am the Alpha and the Omega, the beginning and the end, saith the Lord, Which is and Which was and Which is to come, the Almighty” (Rev.1:8), proclaimed the Spirit of God through the Apostle John. Thus in about the year 67 was written the Apocalypse of the holy Apostle John the Theologian. In this Book was a revealing of the tribulations of the Church and of the end of the world. After his prolonged exile, the Apostle John received his freedom and returned to Ephesus, where he continued with his activity, instructing Christians to guard against false teachers and their false teachings. In about the year 95, the Apostle John wrote his Gospel at Ephesus. He called for all Christians to love the Lord and one another, and by this to fulfill the commands of Christ. The Church entitles Saint John the “Apostle of Love,” since he constantly taught, that without love man cannot come nigh to God. In his three Epistles he speaks about the significance of love for God and for neighbour. Already in his old age, and having learned of a youth who had strayed from the true path to begin following the leader of a band of robbers, the Apostle John went out into the wilderness to seek him. Catching sight of the holy elder, the culprit tried to hide himself, but the Apostle John ran after him and besought him to stop, and promising to take the sins of the youth upon himself, if only he should but repent and not bring ruination upon his soul. Shaken by the intense love of the holy elder, the youth actually did repent and turn his life around. The holy Apostle John died at more than an hundred years old. He far outlived the other remaining eye-witnesses of the Lord, and for a long time he remained the sole remaining eye-witness of the earthly paths of the Saviour. When it became time for the departure of the Apostle John, he withdrew out beyond the city limits of Ephesus, being together with the families of his disciples. He bid them prepare for him a cross-shaped grave, in which he lay, telling his disciples that they should cover him over with the soil. The students with tears kissed their beloved teacher, but not wanting to be disobedient, they fulfilled his bidding. They covered the face of the saint with a cloth and filled in the grave. Learning of this, other students of the Apostle John came to the place of his burial, but opening the grave they found it empty. Each year from the grave of the holy Apostle John on 8 May there came forth a fine ash-dust, which believers gathered up and were healed of sicknesses by it. Therefore the Church celebrates the memory of the holy Apostle John the Theologian still even also on 8 May. The Lord bestowed on His beloved disciple John and John’s brother James the name “Sons of Thunder” – as an awesome messenger in its cleansing power of the heavenly fire. And precisely by this the Saviour pointed out the flaming, fiery, sacrificial character of Christian love, – the preacher of which was the Apostle John the Theologian. The eagle – symbol of the lofty soaring of his theological thought – is the iconographic symbol of the Evangelist John the Theologian. The appellation “Theologian” is bestowed by Holy Church only to Saint John among the immediate Disciples and Apostles of Christ, as being the seer of the mysteried Judgements of God.